Ever since acquiring an Instant Pot Cooker, Bill and I have been testing out lots of new and old recipes in this amazing cooking vessel. We have realized that many of the one-pot Mediterranean recipes we’ve been eating for a long time work perfectly to make healthy instant pot recipes that are easy and quick. Once you learn how to use the Instant Pot correctly, you can have a healthy Mediterranean meal on the table in no time. The meat comes out tender and the vegetables cooked all the way through. The Instant Pot also does a great job of creating sauces and broths that are perfect for mopping up with good crusty bread. If you don’t have an Instant Pot yet, what are you waiting for? It will change the way you cook and will save you so much precious time. Enjoy these recipes and share them with your friends and family! Beans are huge in the Mediterranean Diet. 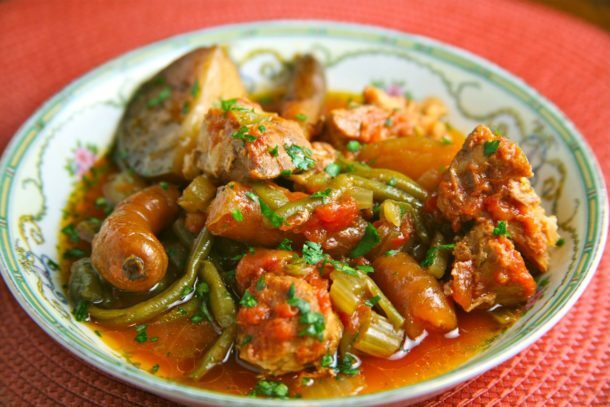 Fasolakia is a very traditional Greek dish in the “ladera” family. “Ladera” are foods cooked in a lot of olive oil that are served warm or at room temperature. They are usually cheap to make but very filling and delicious. This is one of the best instant pot recipes i’ve tried. This horta recipe has been one of our most popular recipes on Mediterranean Living for a long time and now the Instant Pot version is here! The normal version takes around an hour to cook. Horta (Greens) and potatoes in the instant pot takes only 15 minutes! The end result is amazingly the same. This Moroccan inspired dish is a fusion between a Mediterranean Diet recipe and the flavors of New England. I have cooked this for thousands of people in my workshops and many have told me that I should bottle the sauce. It is the perfect blend of sweet and tangy, combining honey, molasses and Dijon mustard with Moroccan spices. You can cook this on the stove top, a Dutch oven or in a crock pot, but here we use an instant pot which cuts the cooking time in half and the instant pot chicken comes out even more tender than other cooking methods. This Instant Pot beef stew is an adaption of an old traditional Italian recipe. The rich blend of beef, sage and red wine makes me think of a family eating in a rustic farmhouse. Like any good beef stew it is best served with bread to sop up the delicious juice. You can also serve with rice or egg noodles. I personally often eat this stew without any grain at all. The newest of my Instant Pot Chicken recipes! A few months ago I created a recipe using chicken thighs, mustard greens, and olives in the cast iron skillet. I thought this would be a perfect recipe to adapt for the Instant Pot. The reason I created the first recipe was because I wanted a recipe that would have people enjoying mustard greens. This recipe, by Koula Barydakis, has been on Mediterranean Living since 2013. It’s an absolute go-to recipe for us. Five years have gone by and we got our hands on an Instant Pot Cooker. Now this traditional recipe from Crete, that was already super simple to make, is even simpler!